My Life As a Frog is a rich and fulfilling story that is one part metaphor and two parts heartwarming human interest. Mr. Greene is a man who, despite being unable to speak, nevertheless exudes determination to excel in his position first as janitor in one building, then supervisor over six more. His new employees don’t want to do things his way, seeking only to keep doing their janitorial duties as they have always done — at a bare minimum. But Mr. Greene is quietly — and doggedly — persistent, making clear what his standards are, then enforcing compliance. It’s not always easy. He is plagued by the insecurities of a troubled childhood that left him with a tendency to severely downplay his intelligence. Arriving home before dawn each day, Mr. Greene goes through his comfortable routine by following his checklist. Feed the cat. Check. Brush my teeth. Check. Go to sleep, with the blinds firmly down. Check. And he dreams. Colorful, vivid dreams, in which he becomes the “alpha tadpole” leading his school ever closer to the shimmering light of the surface. But is danger waiting there? Will Mr. Greene unknowingly nudge his following schoolmates right into the gaping mouth of a big fish? He worries each day, as he dreams, that this drastic outcome is one he cannot avoid. Time passes and, one by one, Mr. Greene’s new employees either shape up or clear out. He is genuinely surprised by his success. He has never been this far out of his routine and previous comfort zone. Then, one day, he prevents a robbery on the subway and meets Dr. Regina Warfield. It’s a pivotal moment in his life but he doesn’t know it yet. He simply goes home after the incident, feeds his cat, and dreams yet again. He’s a bigger tadpole now, still leading his school, nudging them to turn this way or that, or dive to the bottom to avoid the enormous, tadpole-eating fish that is their nemesis. He also dreams of his Momma, and about the men in blue who took him from her as a child and placed him with an abusive father. 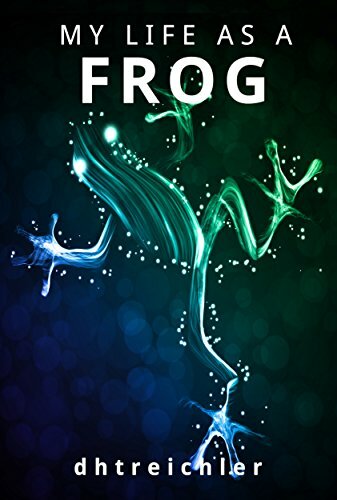 Then, this remarkable book goes on to imaginatively draw parallels between Mr. Greene’s emerging management experience and the tadpole world he dreams of each night. There are, indeed, many subtle similarities that readers can take away as lessons in leadership. There’s also drama, and mystery, and action, and romance in this novella — and even one delicious moment of sexual awakening that will leave you chuckling for days at the memory of it. Five-plus stars to My Life As a Frog. It’s by far the most unique story you’ll read this year. Thoroughly unpredictable and well-written, the characters are alive and believable, and you’ll feel you’re right there beside Mr. Greene, buffing the entryways and raising the performance bar for his team of cleaners from dusk til dawn each day.